An impacted tooth simply means that it is malpositioned covered with bone and / or gum tissue. Persons frequently develop issues with impacted third molar teeth, or wisdom teeth. The wisdom teeth get “stuck” in the posterior of the jaw and can give rise to painful infections among a variety of other issues. (See Impacted Wisdom Teeth under Procedures). 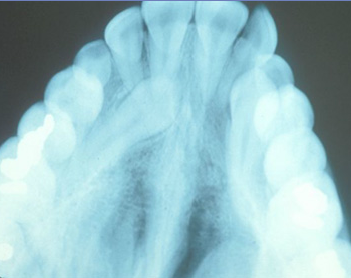 The maxillary cuspid (upper eyetooth) is the second most frequent tooth to be impacted. The cuspid tooth is a critical tooth in the dental arch and plays a major role in your “bite.” The cuspid teeth are extremely strong biting teeth and have the longest roots of any human teeth. They are designed to be the first teeth that touch when the jaws close together because the cuspid teeth are to guide the rest of the teeth into proper position. Generally the maxillary cuspid teeth are the final “front’ teeth to erupt. They normally come into place around the age of 13 and result in any space left between the upper front teeth to close tighter together. If a cuspid tooth becomes impacted, every effort will be performed to achieve correct position in the dental arch. The techniques involved to aid surfacing may be applied to any impacted teeth in the upper or lower jaw, but normally they are applied to the maxillary cuspid (upper eye) teeth. Sixty percent of the impacted eyeteeth are positioned on the palatal (roof of the mouth) side of the dental arch. The rest of the impacted eye teeth are located in the middle of the supporting bone but stuck in a raised position about the roots of the adjacent teeth or out to the facial side of the dental arch. The older a patient becomes the more likely an impacted canine will not surface by natural causes alone even if the space is allocated for the tooth to fit in the dental arch. The American Association of Orthodontists always recommend a panorex screening x-ray, along with a complete dental examination, be performed on all dental patients around the age of seven years to be able to count the teeth and predict whether or not all the adult teeth are present or missing. Is there extra teeth present or any unusual growths that might be blocking the eruption of an eyetooth? Is there any crowding issues or too small of spaces available causing disturbance in the pattern of eruption? A general dentist or hygienist normally performs this exam, who will then refer you to an orthodontist if an issue is identified. 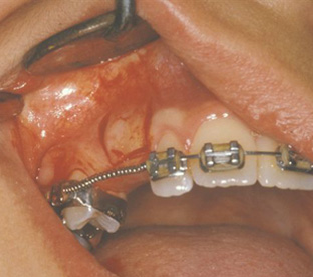 Treatment of such may involve an orthodontist placing braces to open spaces to allow for correct eruption of the adult teeth. Treatment can also require an additional referral to a surgeon for extraction of over- retained baby teeth and/or certain adult teeth that might be blocking the eruption of the canines. The oral surgeon should also remove any extra teeth (supernumerary teeth) or growths that might be blocking the adult teeth. If the surfacing path is cleared and the space is available by the age of 11 or 12, there is a high chance the impacted eyetooth will surface on its own. If the patient is too old (over 40), there is higher probability that the tooth is fused in position or ankylosed. In these cases the tooth will not move despite all the efforts of the orthodontist and the oral surgeon to guide it into position. At this point the only option is to remove the impacted tooth and look into alternative treatment options to replace it with a dental implant or a fixed bridge. In the cases where the canines are not going to surface spontaneously, the orthodontist and the oral surgeon work together to get the impacted teeth to erupt. Each case must be examined on a individual basis but the treatment will generally involve a group effort between the orthodontist and the oral surgeon. 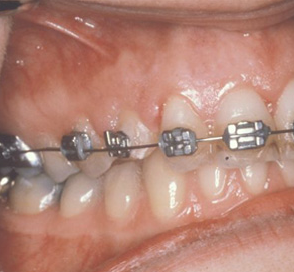 The normal scenario will require the orthodontist to insert braces on the teeth (at least the upper arch). A position will be opened to provide space for the impacted tooth to be relocated to its correct alignment in the dental arch. If the baby eyetooth has not fallen out already on its own, it will generally be left in place until the room for the adult eyetooth is ready. Once the room is available, the orthodontist will refer the patient to the oral surgeon to have the impacted canine exposed and bracketed. In a small surgical procedure performed in the surgeon’s office, the gum on top of the impacted tooth will be raised to expose the hidden tooth underneath. If there is a baby tooth present, it can be removed at the present time. 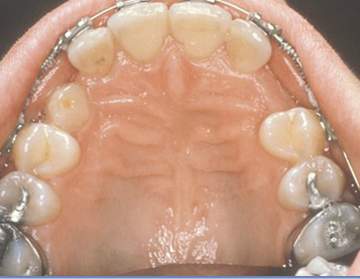 After the tooth is exposed, the oral surgeon can bond an orthodontic bracket to the exposed tooth. The device many times miniature gold chain attached. 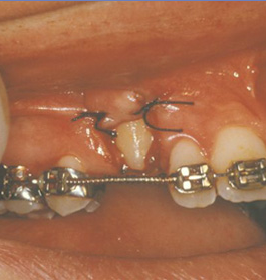 The oral surgeon can guide the chain back to the orthodontic arch wire where it is temporarily attached. Occasionally the surgeon might leave the exposed impacted tooth entirely uncovered by suturing the gum up about the tooth or making a window in the gum covering the tooth (on certain cases positioned on the roof of the mouth). Generally the gum can be returned to its original position and sutured back with only the chain being visible as it exits through a tiny hole in the gum. A few days after surgery (1-14) the patient may return to the orthodontist. A rubber band may be attached to the chain to put a small amount of tension on the impacted tooth. This force begins the process of movement of the the tooth into its correct location in the dental arch. Movement is highly controlled, slow procedure that may take up to a full year to be completed. Remember, the goal is to have the impacted tooth surface or erupt, not extract it! After the tooth has been moved in the arch in its permanent location, the gum around it can be raised to make sure it is sufficiently strong and healthy enough to last for a lifetime of tooth brushing and chewing. In certain situations, especially those where the tooth must be moved a long distance, there might be minor gum surgery that will need to occur to add bulk to the gum tissue over relocated tooth so it stays healthy during normal function. Your dentist or orthodontist should be able to explain the situation to you if the need arises. There are basic principles that may apply to any impacted tooth in the mouth. It is not that rare for both the maxillary cuspids to be impacted. In these few cases, the room in the dental arch form will be prepped on both sides at the same time. When the orthodontist is ready, the surgeon will expose and bracket both teeth in the same procedure so that the patient only has to heal from a single surgery. The anterior teeth, incisors and cuspids, and the bicuspid teeth are smaller and have single roots. The molar teeth are quite bigger teeth and have multiple roots causing them to be more difficult to move. The orthodontic maneuvers required to manipulate an impacted molar tooth are more complex because of their location in the posterior aspect of the arch. In recent studies, it has been shown that with early identification of impacted teeth other than wisdom teeth, treatment may be started at a younger age. After the general dentist or hygienist identifies a potential eruption disturbance, the patient may be referred to the orthodontist for early examination. 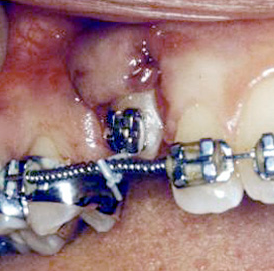 In few cases the patient may be sent to the oral surgeon before braces are applied to the teeth. As mentioned earlier, the surgeon should be asked to remove over retained baby teeth and/or select adult teeth. He may also extract any extra teeth or growths that are blocking the eruption of an adult tooth. Finally, he should be asked to simply expose an impacted eyetooth without attaching a bracket and chain this makes for a simpler surgical procedure than having to expose and bracket the impacted tooth. By the time the patient reaches the proper age for the orthodontist to apply braces to the dental arch, the eyetooth should have surfaced enough that the orthodontist will be able to bond a bracket to it and relocate it into place. In the long run, this procedure will save time for the patient and less time in braces. The surgery to expose and bracket an impacted tooth is a very straightforward surgical procedure that is performed in the oral surgeon’s office. For most patients, it is performed with using laughing gas and local anesthesia . In selected cases it will be performed under IV sedation if the patient desires to be asleep, but this is generally not necessary for this procedure. The procedure is generally scheduled for 75 minutes if one tooth is being exposed and bracketed and 105 minutes if both sides require treatment. If the procedure only requires exposing the tooth with no bracketing, the time required will be shortened by about one half. These issues will be discussed in detail at your preoperative consultation with your doctor. You can also refer to Preoperative Instructions under Surgical Instructions on this website for a review of any details. The patient will be able to expect a small and limited amount of bleeding from the surgical sites after surgery is completed. However there can be some slight discomfort once surgery is completed. Normally patients find that Tylenol or Advil are more than enough to manage the pain they are having. Within two to three days after the procedure there usually is little need for any medication at all. There may also be some swelling post-operatively. Bruising is not a common finding at all after these cases. A soft, bland diet is recommended at first, but you may resume your normal diet as soon as you feel comfortable chewing. It is advised that you avoid sharp food items like crackers and chips as they will irritate the surgical site if they jab the wound during initial healing. Your doctor will see you seven to ten days after surgery to evaluate the healing process and make sure you are maintaining good oral hygiene. You should plan to see your orthodontist within 1-14 days to activate the eruption process by applying the proper rubber band to the chain on your tooth. As always your doctor is available at the office or can be beeped after hours if any problems should arise after surgery. Simply call Pasqual Oral & Maxillofacial Surgery at 561-900-9080 if you have any questions.